Why are fewer people participating in this job training program? How does the declining impact and profitability of this program influence our organization as a whole? How do we reshape our work to provided needed services while generating resources to support key programs? As leadership adjusts the organization’s strategy over time, it must consider how external factors exert influence on the nonprofit’s business model – which encompasses both programs and finances – to enhance sound decision making. 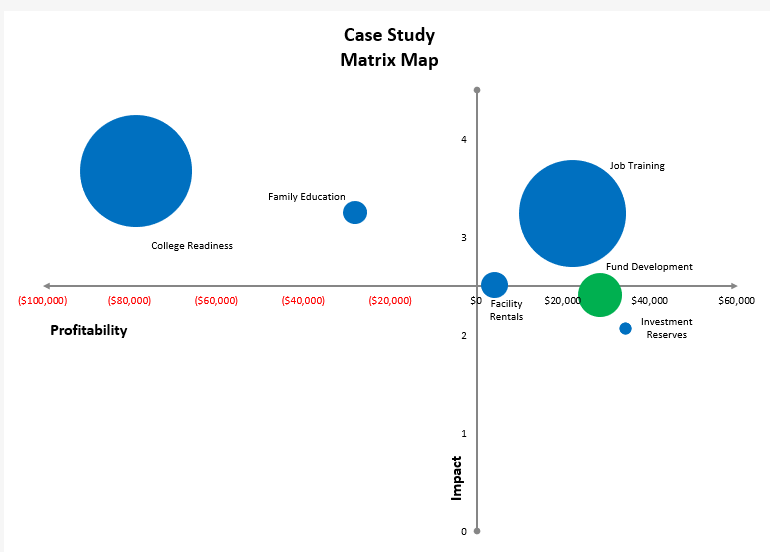 Our work on nonprofit business models leverages the matrix map tool, a visual depiction of how an organization’s programs work in concert to deliver exceptional impact in a financially viable manner. By plotting the performance of both mission-specific and fund development programs on the dual-bottom line of impact and profitability, leadership can make strategic decisions in a holistic manner to strengthen the organization’s business model and sustainability. 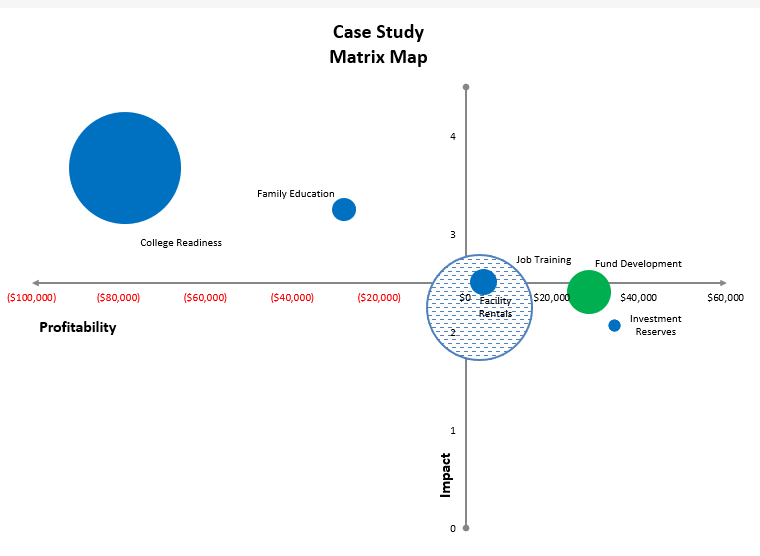 The map above reflects a snapshot of the organization to which we referred earlier at a moment in time; however, the impact and profitability of programs are constantly moving in response to strategic priorities, implementation, and market influences. Spectrum’s market framework identifies five relevant populations influencing the map, and allows for a deeper understanding of the messages from it. The shifting of programs year after year affects the organization’s sustainability and a market analysis helps surface the external versus internal causes of programs’ movements, enabling leadership to make strategic decisions and adjustments to strengthen the business model. Plotting our job training program on the map in this moment illustrates the program’s diminished impact and increasing required subsidy. Using the market framework to examine relevant influences, leadership may realize that the job training program experiences increased competition from the largest employer in the city starting its own job training program; therefore, a significant portion of the organization’s direct beneficiaries no longer have this need. However, the need may still exist with a different population, which means a refinement of the program – possibly to focus on the unemployed or homeless population – could increase impact and secure additional funding. This exploration can be done first by examining and understanding the market segments and then seeing how those might affect the programs on the matrix map, or, if you’ve done the map before, revising the map and then exploring which programs are most likely to be influenced by market forces. The latter is particularly useful if the programs serve different markets. The market wheel does not seek to provide a strategic answer, but instead offers a systematic method of exploring the external forces shifting key programs. 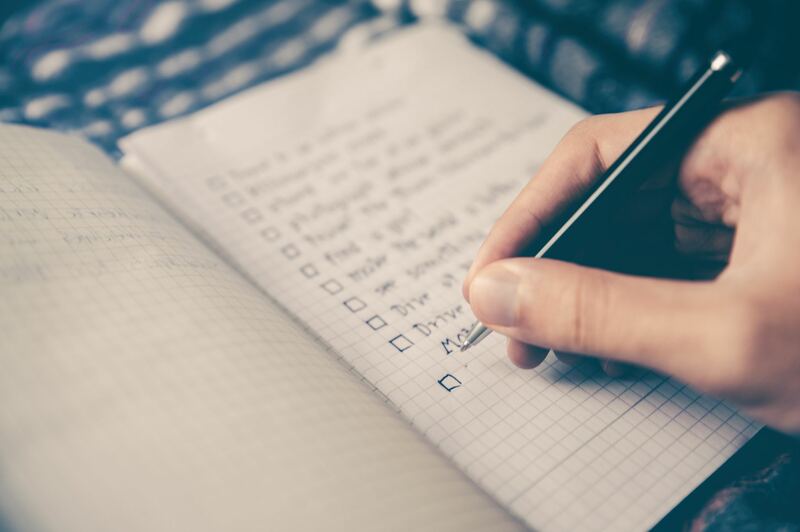 Such analysis allows leadership to ascertain the severity of those pressures and to identify strategic priorities to strengthen the organization. This blog is part five in our series on Community Influence & Understanding Nonprofit Markets, which is drawn from our new white paper by the same name. Check out our fourth blog on this topic, Focusing Your Market Analysis.